Get started with our Questrade offer code today and get $50 in free commissions. For the most part, penny stocks have a bad reputation. It really depends on what magnitude of a security you are talking about. Let’s just say that penny stocks pose substantially more risk, even done the correct way, than say buying value or dividend stocks. And in general, how to trade or invest in Canadian penny stocks. This is a simple yet highly complicated question with as many answers as there are investment professionals in this world. It’s a stock of a small company that has highly illiquid and speculative shares. Has a small following and almost never covered by analysts in the industry. Usually traded over-the-counter (OTC) or through pink sheets. If you are unsure about these terms, then please take a look at our financial terms glossary. They are below $5, however, this is not a hard and fast rule. Let’s face it, if you are looking to buy or start day trading penny stocks in Canada you should be comfortable with the risk and volatility involved with trading penny stocks. You aren’t buying a blue chip stock like Royal Bank, Apple or Microsoft. Which is why buying penny stocks is not the same as buying normal stocks on the big exchanges. These stocks usually represent small cap and specifically ‘micro-cap’ companies that operate in various niches. Two of most important characteristics that a beginner needs to understand with Canadian penny stocks and penny stocks in general are illiquidity and speculation. An illiquid stock is one that it is not traded often. In other words, there aren’t too many buyers and sellers. Think of it this way, if you wanted to sell your old toaster, you won’t find many buyers. But if you tried selling a car that’s in great condition, a number of buyers would appear. Penny stocks are highly speculative. Why is that? Well, it’s because they are bound to experience violent movements in price, upwards or downwards. That being said, they are highly speculative anywhere you go in the world. The reason for this is that most of the top penny stocks today represent companies that are highly leveraged, as in having lots of debt, and are on their way to bankruptcy or are just good old fashioned scams which we will cover coming up next. As a result, their prices can swing strongly and swiftly based on news or industry-specific factors. Factors such as the price of oil, incurred loss due to environmental clean-up costs, or exploration findings for a small cap mining penny stock. This is what makes trading Canadian penny stocks so dangerous. The goal at the end of the day is to make money. Trading Canadian penny stocks is where you find the whopping 100% and 200% daily gains. There are also non-penny stock industries right now like the Canadian cannabis industry where you could find these sorts of returns, but for the most part it will be with penny stocks. On the flip side, it is also where you find the 50% and 100% losses in value as a result of the factors above. You may ask how do you go about picking penny stocks? The key is research. You MUST spend a lot of time looking into these companies the best you can before executing a trade. Let’s start off by teaching you how to avoid popular scams when trading penny stocks in Canada. Looking at the classifications of penny stocks, and the exchanges on which they are traded is one way to minimize risk. Another method to lower your risk exposure is to educate yourself about the different types of scams. 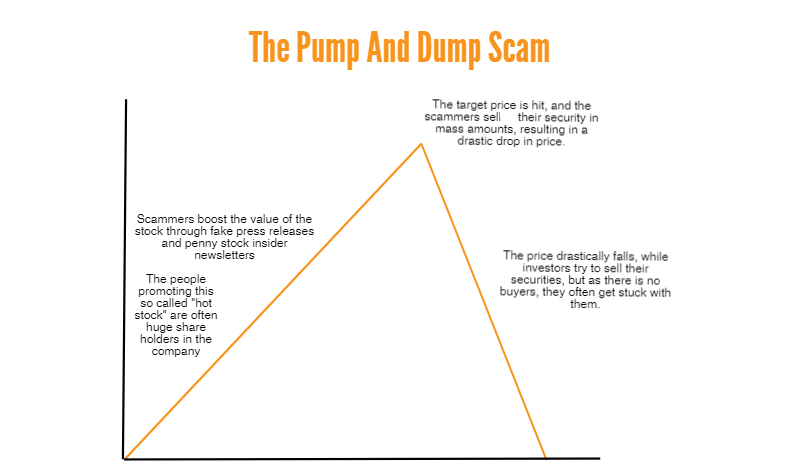 Pump and dump: A good way to identify these scams is to look at penny stock newsletters or a particular list of penny stocks. 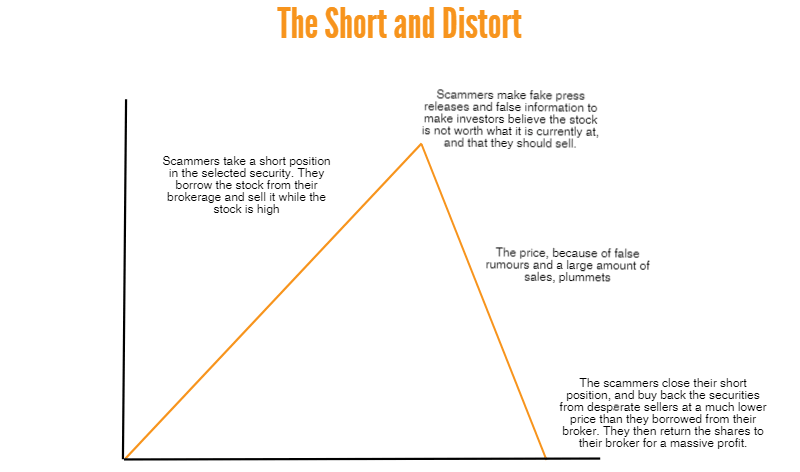 The scammer, who owns a large portion of the security, inflates the price of a stock by making false and exaggerated claims, usually of an unknown company. Naive investors buy and then, when a certain price level is reached – the bad guy sells. This, in turn, plummets the share price, leaving the buyer with the crumbs of what was once their hard earned dollars. Short and distort: Works in a way that is opposite to pump and dump. False and damaging rumors are spread about the company after the scammer takes a short position in the stock. This leads to a sudden fall in price and the bad guy ends up making a profit by closing his short position. Mining scams: A movie was recently made that properly explains the mechanics behind such a scheme, it’s called Gold, starring Matthew McConaughey. False claims of finding gold, diamonds and oil at places where there are none. The Guru scam: The Guru is someone who has made tons of money with penny stocks, using techniques that he or she would sell at a very small price. Not all of these gurus are scammers, but most are. “No Net Sales” Scams: This is quite a clever one, but easy to spot. Penny stock brokers usually tell potential investors that current stockholders will not sell a certain stock unless a price, usually very high, is offered. This causes investors to believe that there is high demand for the stock. So I know about the potential risks from trading penny stocks. How do I avoid them? When buying penny stocks, be aware that smaller sized entities are not required to file documents with the Securities and Exchange Commission (SEC), something that bigger companies are required to do. As a result, it is very difficult to invest in penny stocks profitably as it is almost impossible to accurately determine a company’s financial health and the direction in which it is headed. However, all is not lost. When you buy penny stocks, there are different classifications based on the quality and quantity of the information they provide. As you may have guessed, this classification is also based on the information available. Needless to say, you should run for the hills when it comes to Canadian penny stocks on the OTC Pink-No Information list. Unless of course you have unlimited amounts of money to burn. Do these stocks always move to the bigger exchanges? There is a general belief among Canadian investors that most of the best penny stocks on the TSX Venture usually move up to bigger markets. The argument to back this up usually comes from the examples of Walmart and Microsoft. First, it is important to note that Microsoft and Walmart were never really penny stocks. The only reason they are falsely considered as penny stocks is because of stock splits, and hence the historically adjusted price. The stocks of these companies became so big that they were divided into smaller pieces, and the historical prices reflected this split. So, if Microsoft started with $10, after the split it would have technically been presented at $5 or lower, assuming the stock was split into two. However, that was not the reality, it is presented so only on paper. This does not mean that penny stocks in Canada cannot trade on bigger exchanges such as the NASDAQ, TSX or NYSE. But to do so they have to spend huge amounts of money on paperwork and putting all their financial statements in order – this is something that most penny stock companies in 2018 can’t afford to do. Many Canadian penny stock companies have a small market cap. In turn they are subject to extreme volatility, such as potentially quick changing market forces like commodity prices. Stock scanners can help you identify penny stocks that have the greatest potential. You can make money with penny stocks with the right choice of filters in the scanners. That’s how you can examine chart patterns, performance, volatility, and liquidity. This information is crucial for predicting trends and evaluating the stock’s potential. After making a prediction, check the stock’s standing as soon the market opens to see if the movement supports your conclusions. If your going to dive into Canadian penny stock trading, you will primarily focus on the TSX-V, or the TSX Venture. This index caters to smaller cap companies than the TSX, or the Canadian Securities Exchange, CSE, which finds its niche in private placements. You can find the listing requirements for these exchanges here. This should give you a better idea on the scope of companies playing within the space. As you continue researching a Canadian company that appeals to you, there will usually be some kind of story that plays a part in the pricing. For example, Pharmaceutical Company A is trading at a historical low. However, there is a clinical trial that is nearing fruition and IF it is successful it will make them the best drug in among competitor’s B/C/D. This kind of news is common, and it comes into play most often with the hottest Canadian tech stocks and pharmaceutical stocks. Publicly released information tends to have a huge impact on penny stock prices. To be successful with trading penny stocks in Canada it requires you to have a keen eye for these sorts of releases. Day trading Canadian penny stocks requires you to base your research on macro research, or technical analysis. Macro research will include things like where you believe commodity prices are going. You then use this information to play the game by purchasing small companies in this space that will benefit from an uptrend. For example, marijuana stocks have had a huge uptrend this last while as a result of legalization taking place in parts of the US, and now prospectively in Canada for the future. Technical analysis will explore trends in prices that may indicate the future direction of the stock. These will include typical chart patterns such as “head and shoulders”, but more important would be “break out” points. This occurs when a penny stock is trading at a resistance level and seems to be about to “break through” a certain level. At this point is when it is possible that there will be a price upswing for an enterprising investor. An example would be the image below, observe how the penny stock traded within a range of prices before starting to pick up volume and then break out. 1. The management: Most top investors believe that the management is what makes or breaks a company. Hence, look at the track record of the executives running the firm. 2. The numbers: Pay close attention to the financial statements, but this will be a futile attempt if you don’t know how to read statements properly. 3. Learn to identify promotions: There is a difference between proper equity research reports, which are not really common with penny stocks, and advertisements. If the writer is being compensated for the number of shares sold, then it’s most likely a scam. Such information can be found in the disclosure section of the newsletter (report). How do I make money with Canadian penny stocks? There are two main ways to make money with Canadian penny stocks – trading, and investing. Investing in penny stocks for long periods of time is not recommended. It simply does not work because almost all penny stock companies cease to exist after a short period of time. Trading is the path that most penny stock enthusiasts in Canada and around the world take, however, as mentioned before, if you don’t know what you’re doing then you will end up losing your shirt, and that is not an exaggeration. But if you can identify scams and those diamonds in the rough (no pun intended), then it is possible to make huge returns, sometimes in thetriple digits with Canadian penny stocks. Another caveat when it comes to trading is constant monitoring. You would be glued to your computer screen, and constantly looking at charts to determine when to buy and sell. Hence, trading penny stocks in Canada is more or less like a full time job. That being said, you need a good broker such as Questrade if you’re going to day trade penny stocks. If you aren’t fond of Questrade, we suggest you start with our broker review for 2018. There are credible ways of making money penny stock trading. However, look at it as small-cap and micro-cap stocks. Use this perspective to shift focus continually away from a 1000% return. The same care, research, and sourcing of information is needed just like any other type of investing. Canadian penny stocks do have certain advantages for new investors. Because they are priced so low, you don’t have to invest too much money to get started. If you limit yourself to companies that provide proper documents, then this is also a good place to learn to read and interpret financial statements, because they are most often short and not that complicated. It can also be benefical to invest in penny stocks inside of a Tax Free Savings Account, as those huge returns will not be subject to tax inside of it. If you’re investing in a non registered account, you could be subject to a large capital gains bill, depending on how much you make. Make sure you understand the company you are buying. Watch for factors like management and earnings, and understand the credibility of the stocks “narrative”. Approach with hesitation, and question everything. This will make you a more confident and analytical investor, which will help you avoid some of the scams out there. I wish you some exciting, wonderful, and prosperous trading! I am loosing my way on the information dumping on the internet, can’t find the right link on the Google. Hey Judith thanks for the comment. You can definitely buy these stocks through Questrade. Let me know if you have any other questions. Hey John, thanks for commenting. The best way to learn how to trade is simply education through books,articles, websites such as us etc and a practice account. Head to any broker, most all of them offer paper trading accounts and start to learn there. is questrade good broker to start penny stock trading in canada? thanks. Absolutely Monirul. We voted Questrade our top discount broker of 2017 for some obvious reasons we state in our broker review article. You can view that article here: https://www.stocktrades.ca/online-discount-brokers-review-canada-usa-2017/ . If you sign up through this broker page, we can get you $50 in free trades. Just simply click the Questrade image in the article. Happy trading! I apologize this is not a comment but more a less a question. I am a UK resident and wish to join your trading platform especial interest eing the penny stocks . Kindly advise me if there are any restrictions for us British to join a Canadian Company. Good question Jonathan, and we don’t really know the answer to it. The best advice we can give you is to ask your brokers you have available in the UK how to go about trading international/Canadian securities. Sorry we couldn’t be of help, but that type of question is something we have no experience with. I am sure brokers there have some sort of process for purchasing international stocks though. This article is amazing! You guys provided all the information necessary for trading penny stocks, and on top of that presented it very well. I don’t know how many people read or follow Stocktrades but without a doubt you now have a new fan. Wishing you guys all the best, and I’m glad I found this website. Great article! I was wondering if I could get your opinion on these two profitable penny stock plays: CAF.V(Canaf Group Inc) and TNA.V(Evergreen Gaming Corporation). Hey John! Thank you for reading Stocktrades and we are glad you enjoyed the article. Unfortunately, I understand the fundamentals about how to trade penny stocks, but I have never actually done so. For this reason I have never really monitored a penny stock, and can’t give you any reliable information about you ones you are asking about. One thing I will tell you, is penny stocks in general are extremely volatile, and you’ve got to make sure you are comfortable losing the money you have in your account. could you please tell me which canadian brokers allow trading OTC stocks in there TFSA account ? Hey Neil! Thanks for commenting. I think you will struggle to find a brokerage that allows you to trade OTC stocks in a TFSA. It is not the brokerages, but the government that doesn’t allow it. My broker is RBC, and I was able to purchase stocks listed on the TSXV (Venture exchange) within my TFSA trading account. Hey Mathias. There is nothing that will stop you from buying them in any TFSA. But, as far as I know, OTC stocks are NOT allowed in a TFSA and are subject to tax. Now, don’t quote me on this as I have never wanted to do it so I haven’t done much research on it. But, like you said, you can buy them, just maybe be prepared to pay tax on OTC gains. As far as the TSX Venture goes, I’m not sure if they are legal. Like the old saying goes, everything’s legal as long as you don’t get caught. American OTC stock purchases were blocked by my broker. You are right, after looking it up real quick everything points to the fact that Canadian OTC stocks are taxable within the TFSA. Time for me to call my broker to close the case.